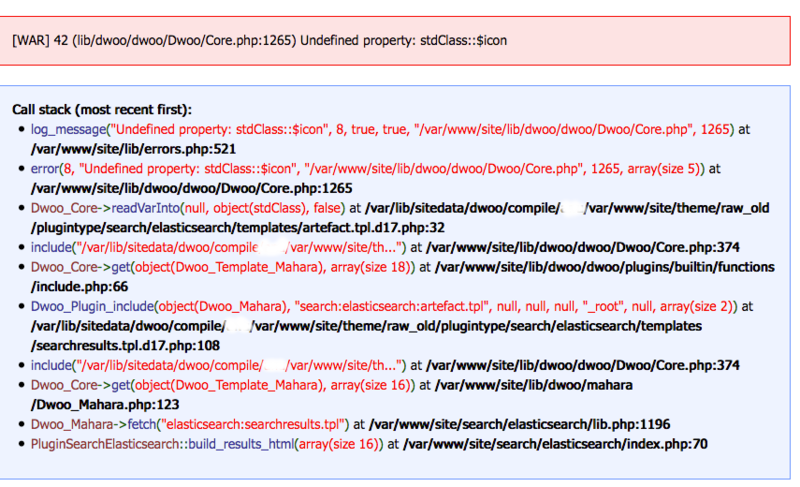 An warning is displayed (and debug is on) when using Elastisearch when searching on data. Please refer to attached image of warning. We are using the raw_old theme but it's also present in raw. I've dug around a bit more. The bug appears (i.e. icon not set) when the user logged in does not match the record owner. If this does not match, the icon and link are not set. And, the error is generated. So, I think the check needs to happen in the template if those values are missing. And, this is how we can test for it. 1. Set up elasticsearch and ensure social profiles are indexed. 3. As user1, add this social profile to your Profile page. 5. As user2, add this social profile to your Profile page. the icon attribute is never set. we can display the link to users.